The bridesmaids prepare for the day at His and Hers Salon in Hebron, Indiana. Mother and bride on the morning of the big day. 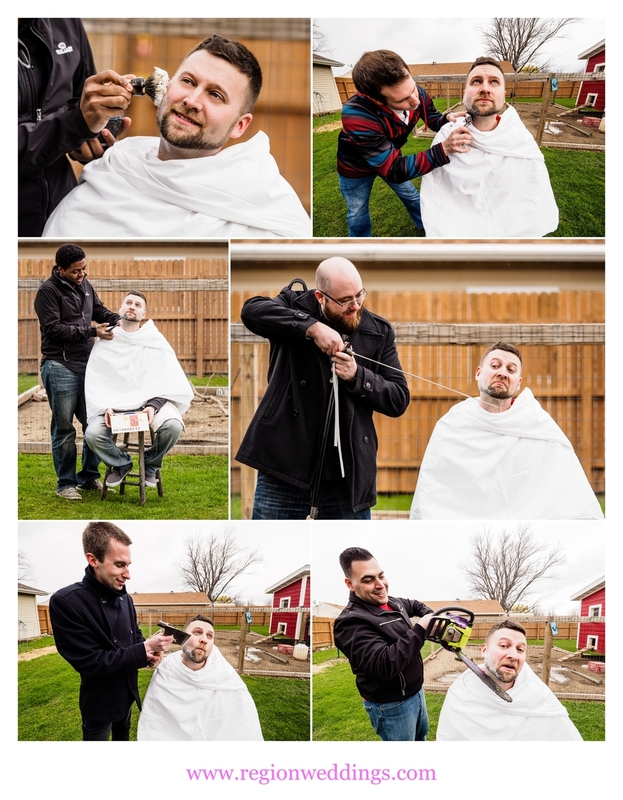 The groom undergoes the traditional Macedonian "shaving of the groom" ritual. Groomsmen and the father of the groom drink a shot after the shaving of the groom. Soon we were back at the church where the wedding party got dressed. Our wonderful first look / reveal would be coming up soon. The mother of the groom secures the boutonniere. After some coaching from me and a brief false start, our first look was underway. I could see the nervous excitement start to build for the groom as his beautiful bride walked down the aisle toward him. First look for the bride and groom at Holy Spirit Catholic Church. Emotion overcomes the bride and groom during their reveal. Melissa looked stunning in her wedding dress. 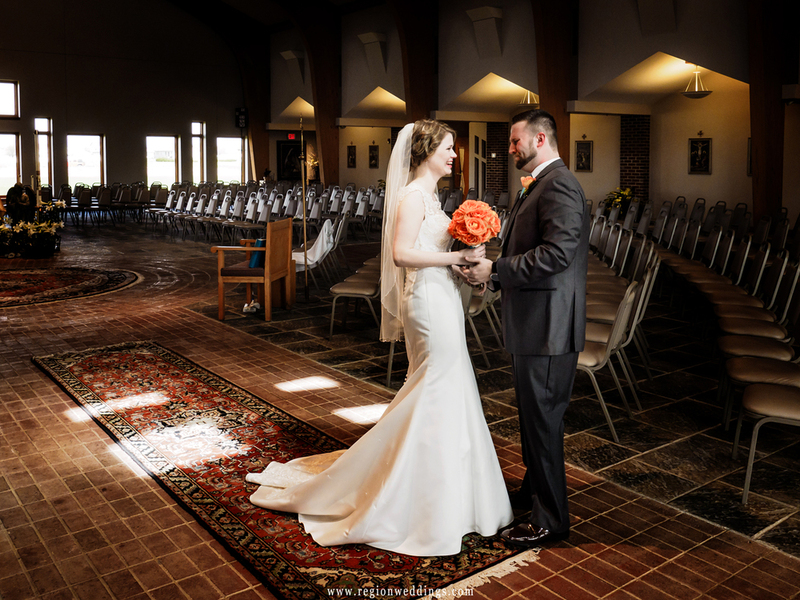 We took this time to photograph her and Dustin together and alone in the glorious architecture of their church. The bride shows off her dress at Holy Spirit Catholic Church. The bride gazes out while holding her bouquet of spring flowers. The ceremony saw the mothers of Dustin and Melissa as featured singers. The newlyweds are movie buffs and theme songs from films played throughout. Even the flower girl approved with a big thumbs up!! Wedding ceremony at Holy Spirit Catholic Church. Holy Spirit Catholic Church in Crown Point, Indiana. We did family wedding photos at the church along with the wedding party at the altar. Then it was off to the downtown Crown Point Square. The wedding party at the church. The bridesmaids muscle their way into the groomsmen coats in exchange for flowers. 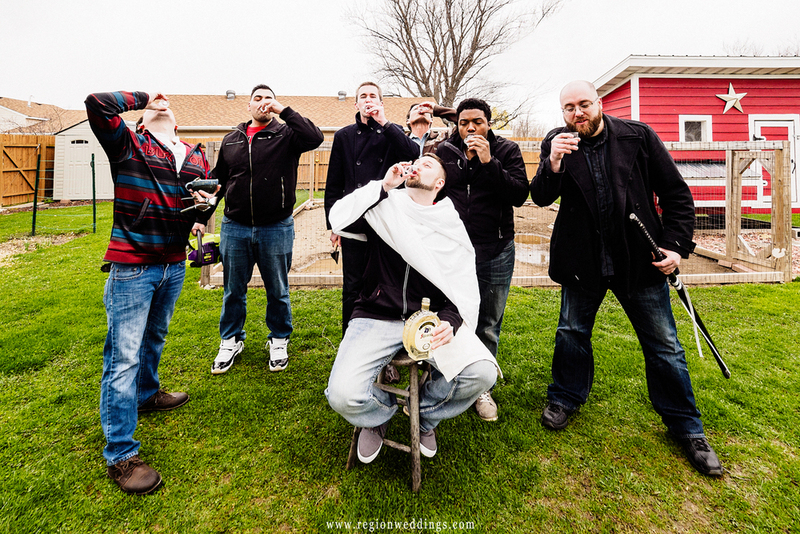 Fun wedding photos at the downtown Crown Point Square. The bride's veil flies in the wind as the newlyweds take a stroll in downtown Crown Point. A sudden snow blizzard engulfs the bride and groom during their wedding photos. The wedding reception took place at Signature Banquets in Lowell, Indiana. The non stop party featured popcorn and a movie soundtrack picked by the couple. We also saw a few more Macedonian wedding traditions such as the pig dance and bread dance. Wedding reception fun at Signature Banquets in Lowell, Indiana. The mother of the groom and father of the bride dance with their children. First dance for the bride and groom at Signature Banquets in Lowell, Indiana. 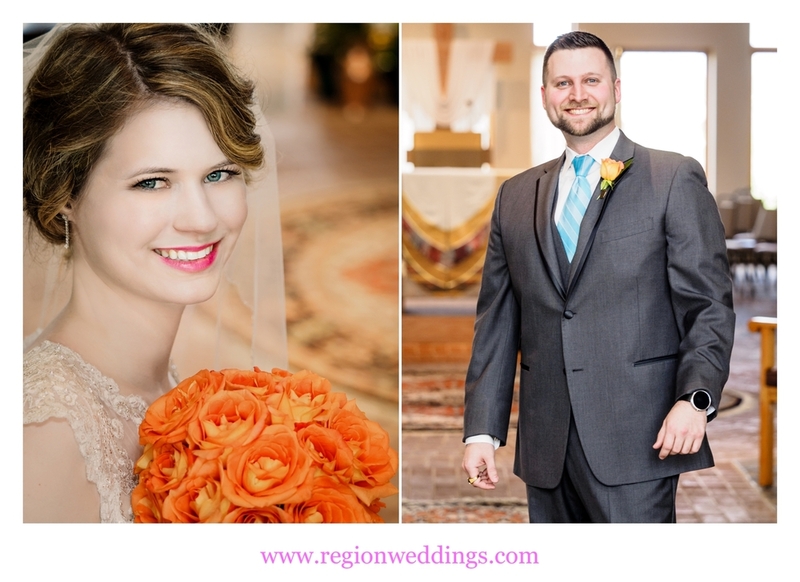 I hope you have enjoyed this sneak peek look at Dustin and Melissa's epic wedding at Holy Spirit Catholic Church in Crown Point, Indiana. Stay tuned to the social media sites below for more images.